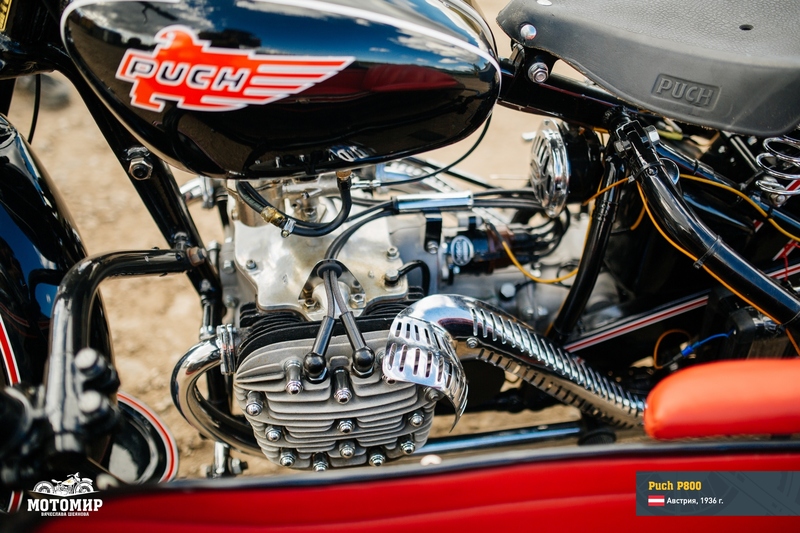 Puch P800 - Мотомир Вячеслава Шеянова | This work is licensed under a Creative Commons Attribution-NonCommercial-NoDerivatives 4.0 International License.  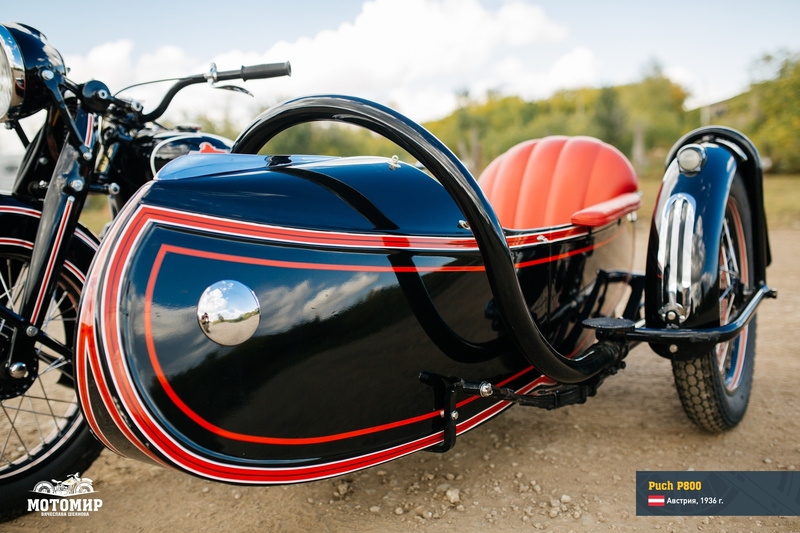 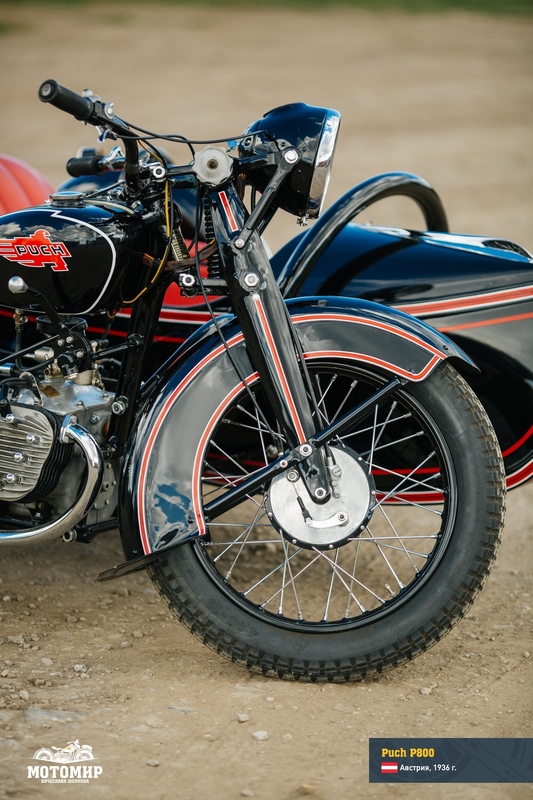 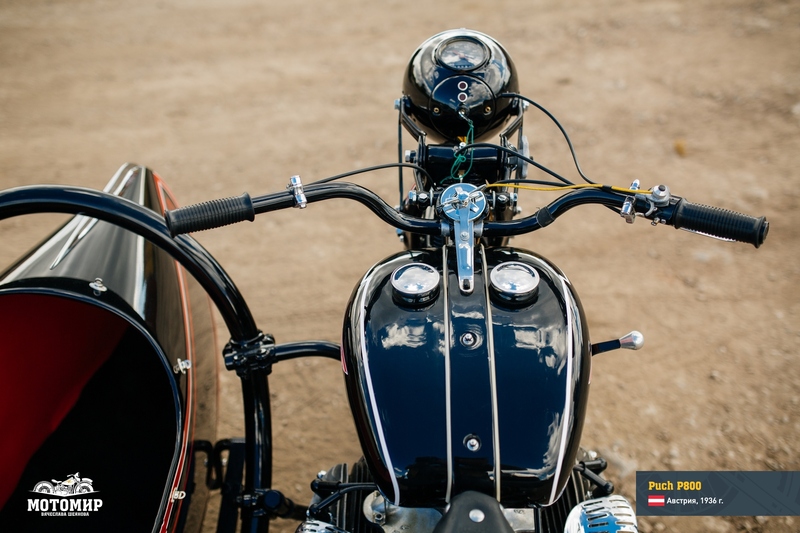 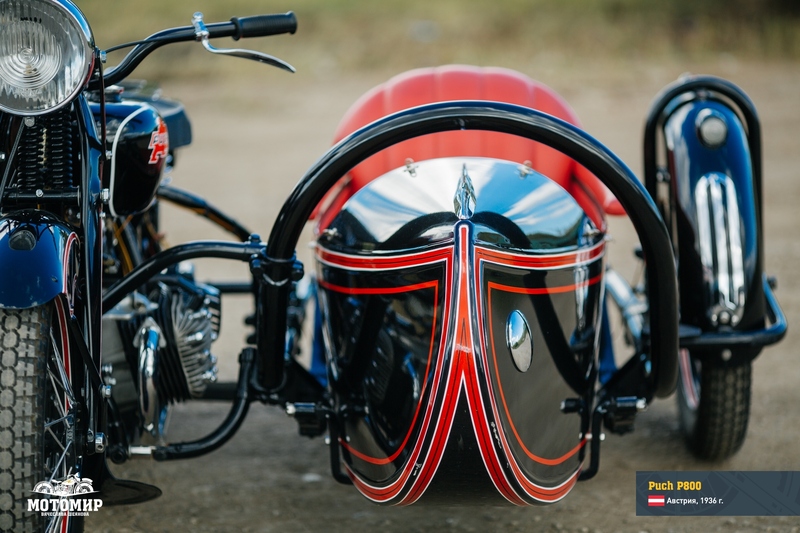 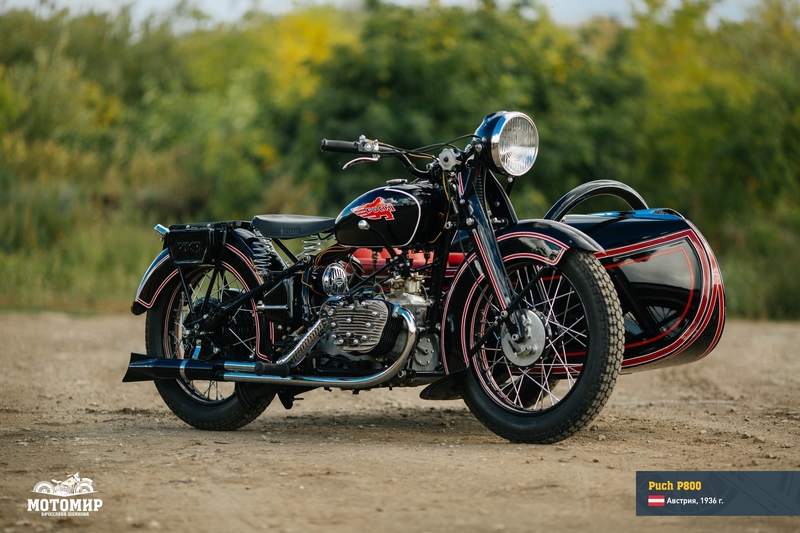 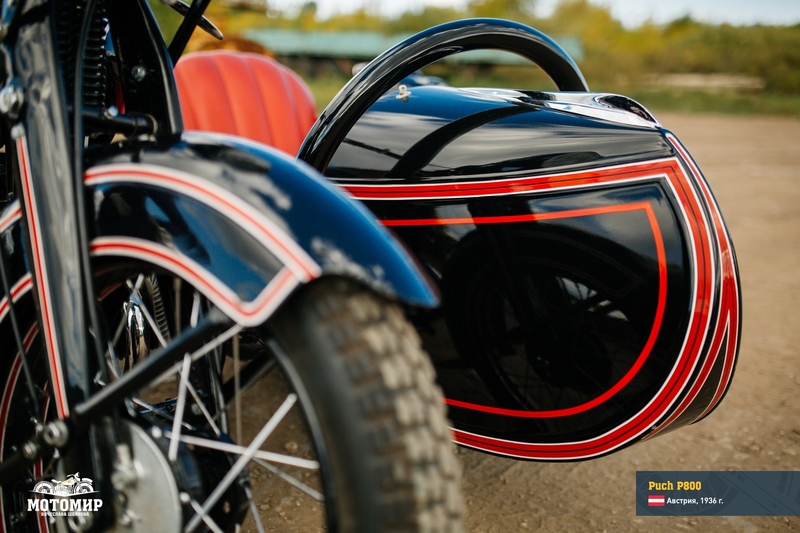 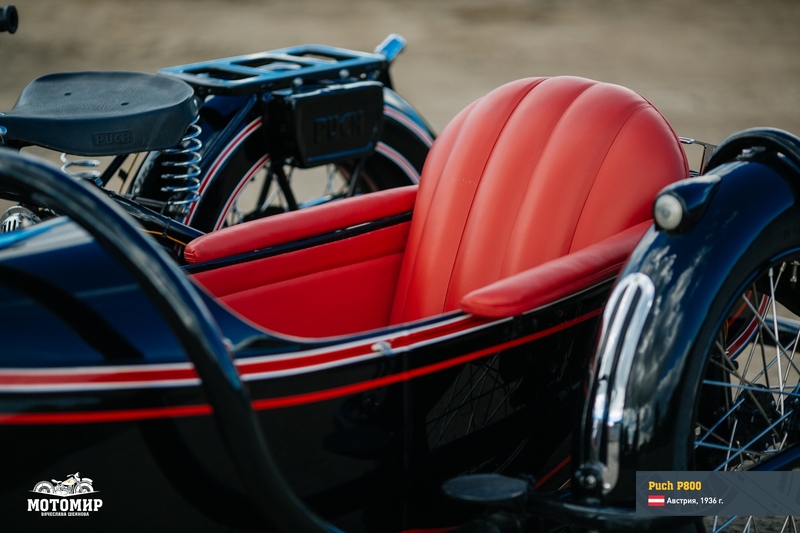 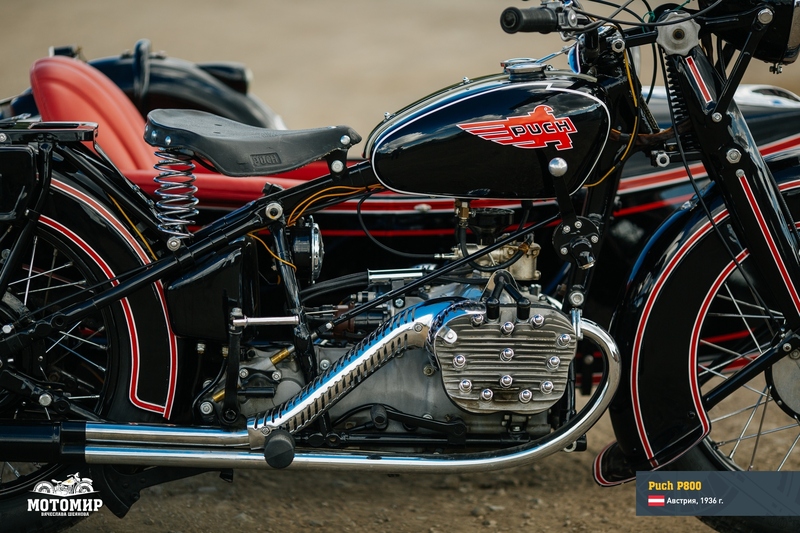 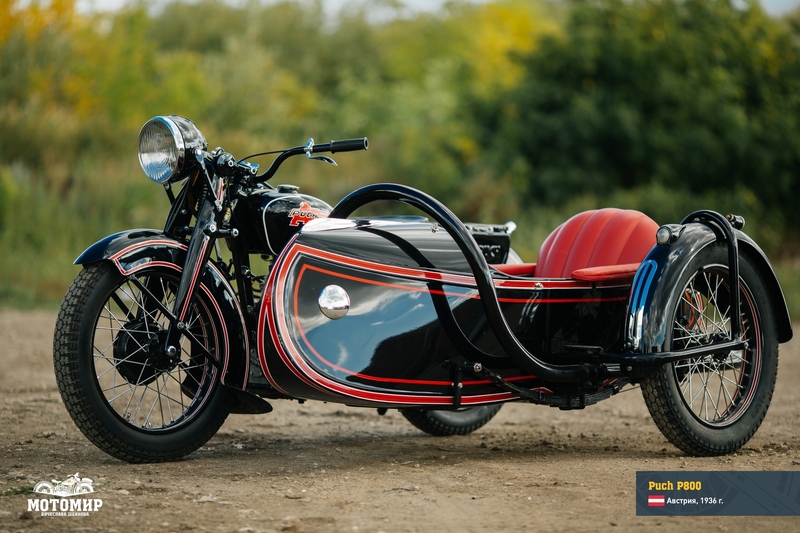 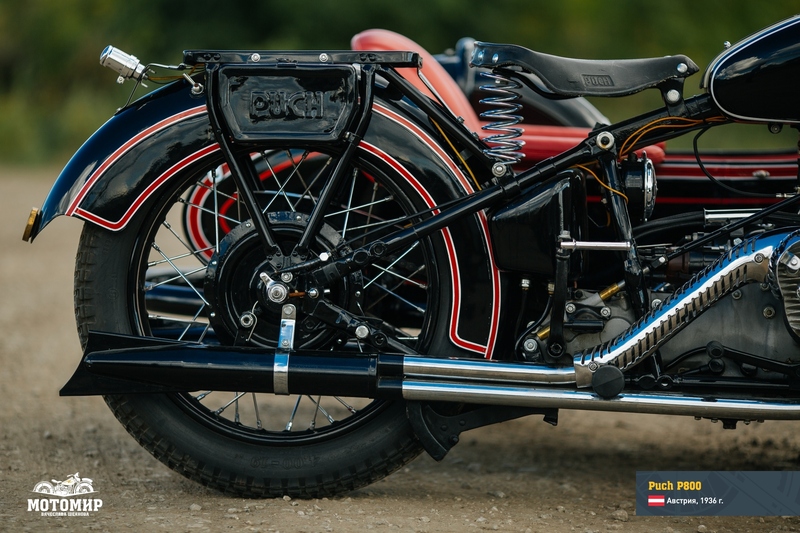 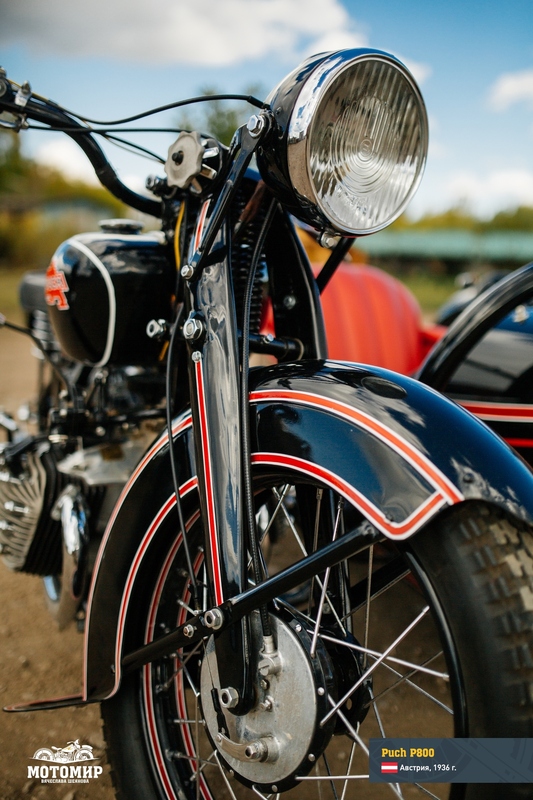 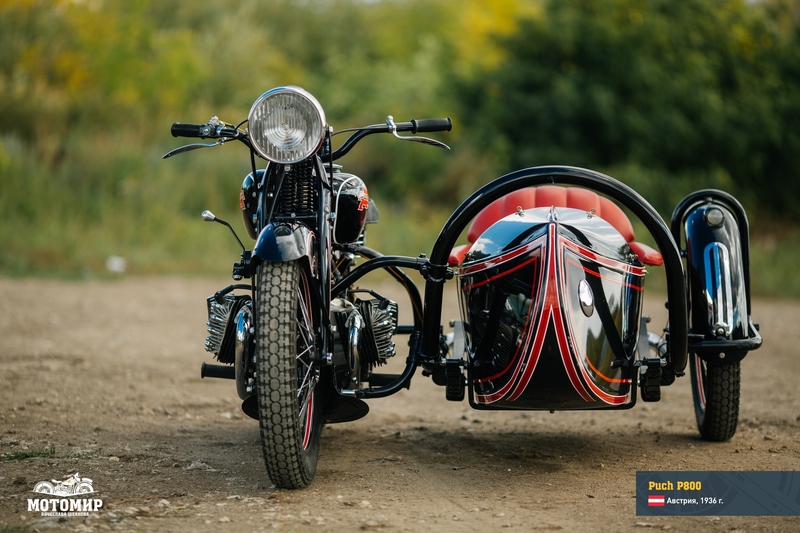 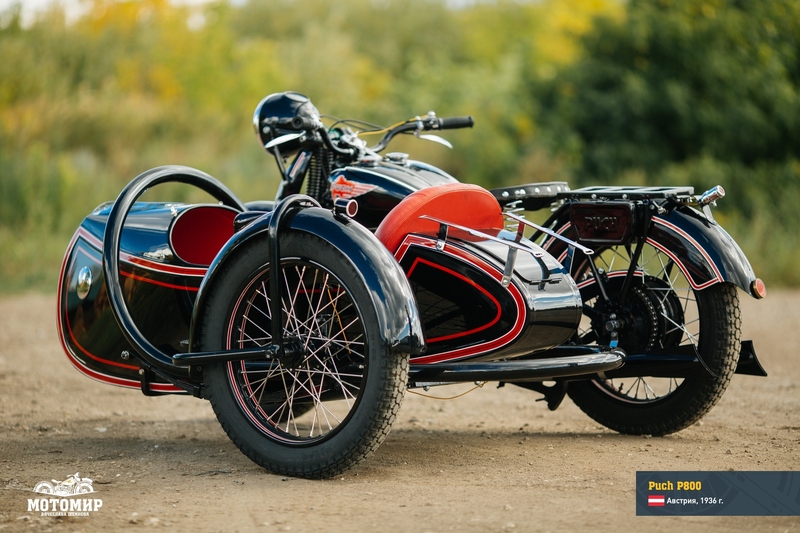 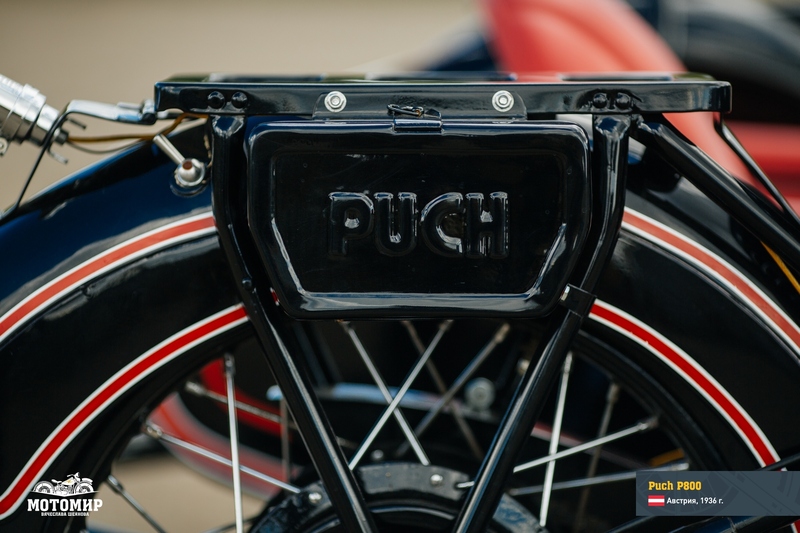 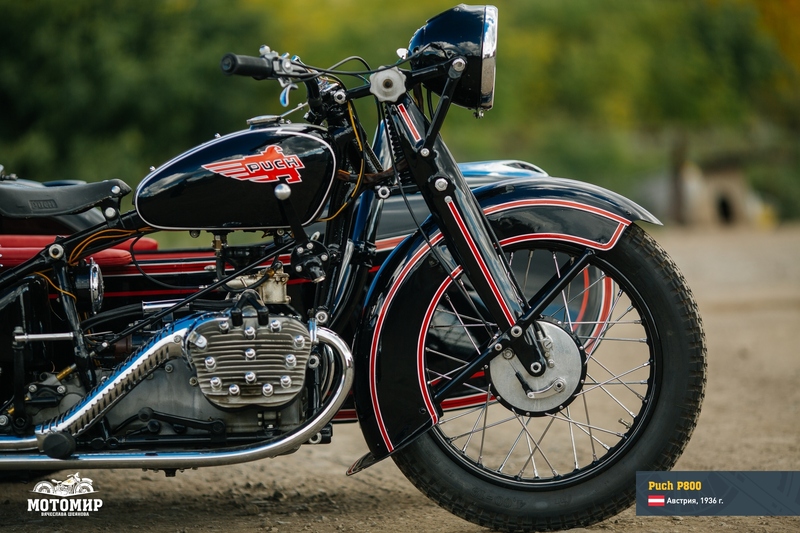 Between the two world wars, the Puch company merged with Steyr and Austro-Daimler creating a new company, Steyr-Daimler-Puch, which by 1934 made it the largest Austrian motorcycle producer. 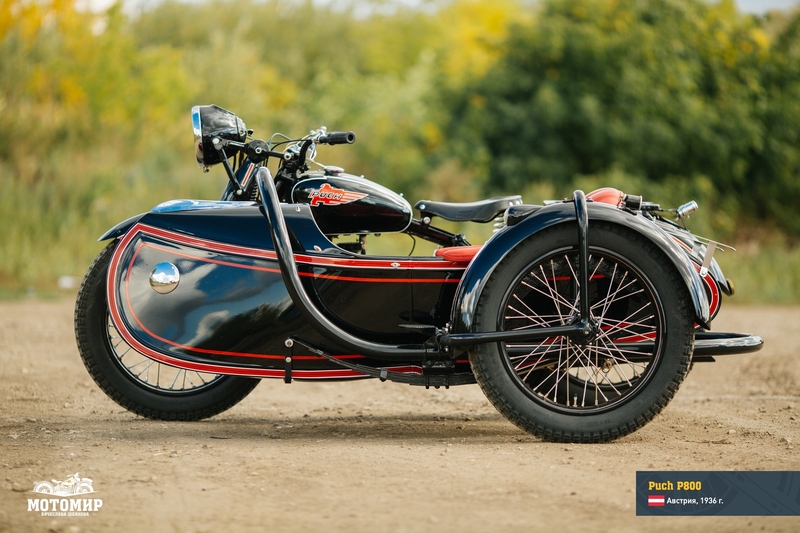 P800, a model from 1936, is a very good example to show what Puch could achieve. 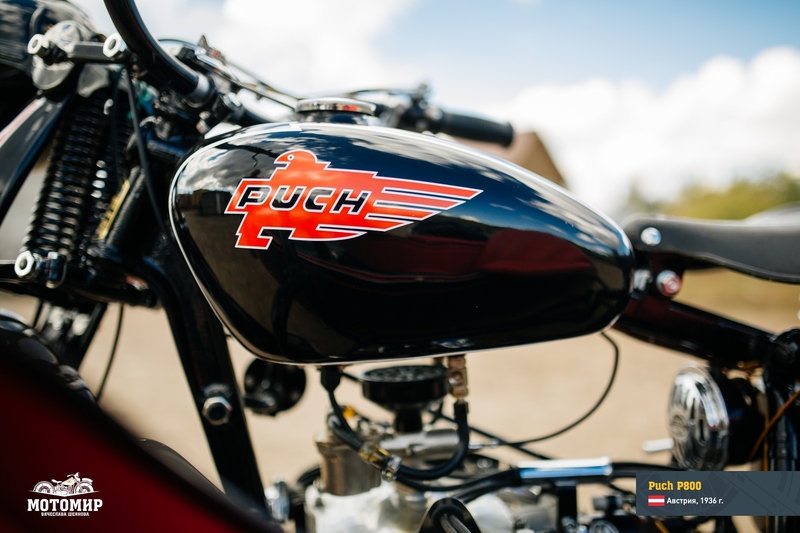 A powerful, unusual, a wonderful motorcycle, the Puch P800, outfitted with a 4-cylinder opposed engine, could achieve the speed of up to 125 km/h. 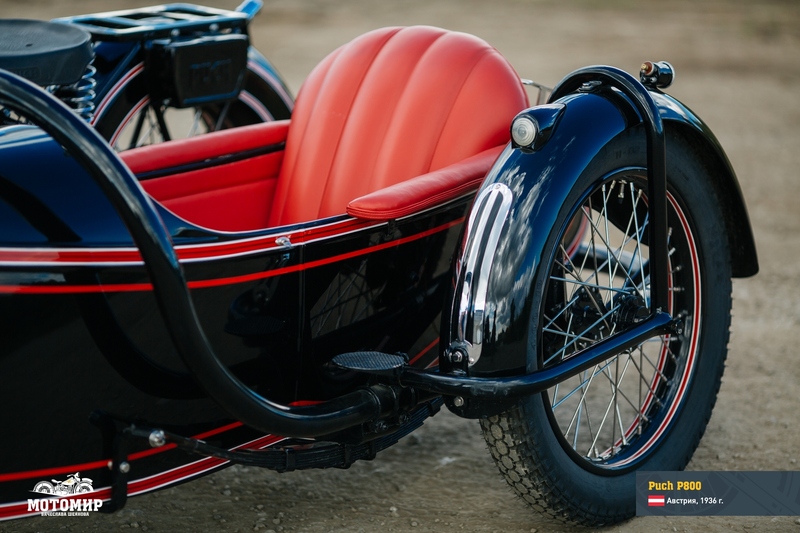 Although this model was designed for civil applications and for the police, it was, nevertheless, used in the Austrian army and later on was also adopted by the Wehrmacht. 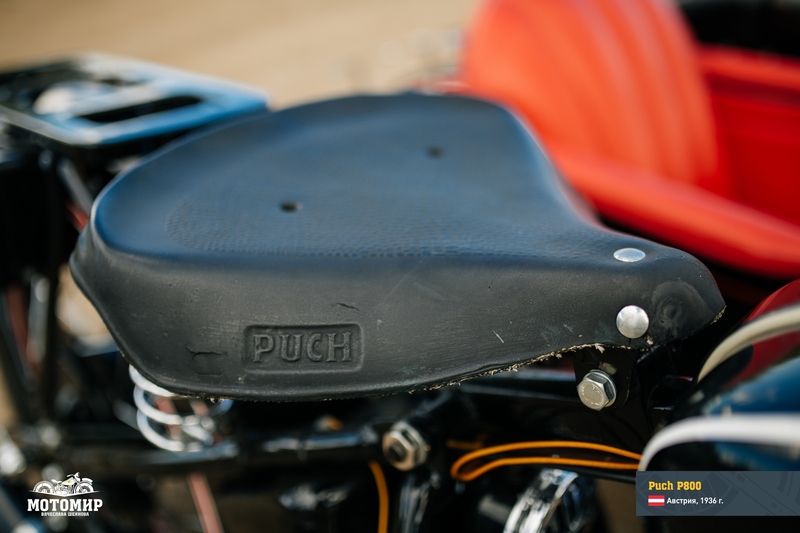 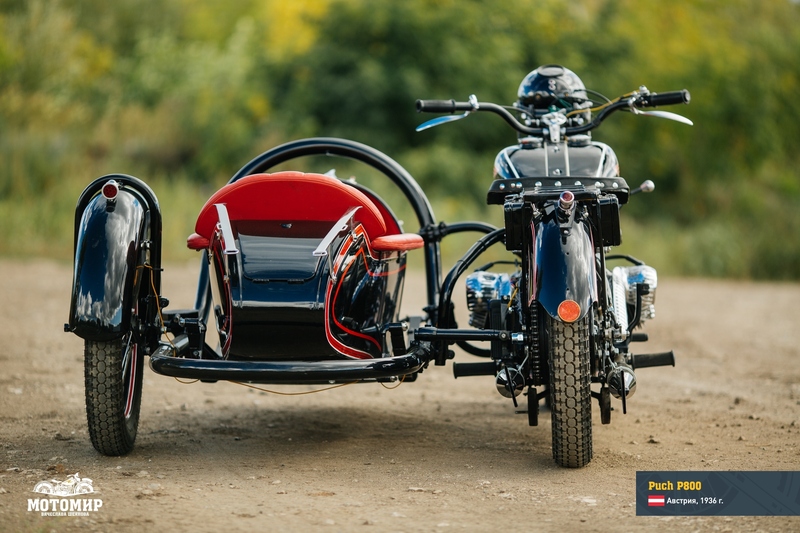 The Puch P800 was supplied in different versions, both with and without the sidecar, and that was unusual for motorcycles of its type, but the most interesting feature of this model was, undoubtedly, its engine. 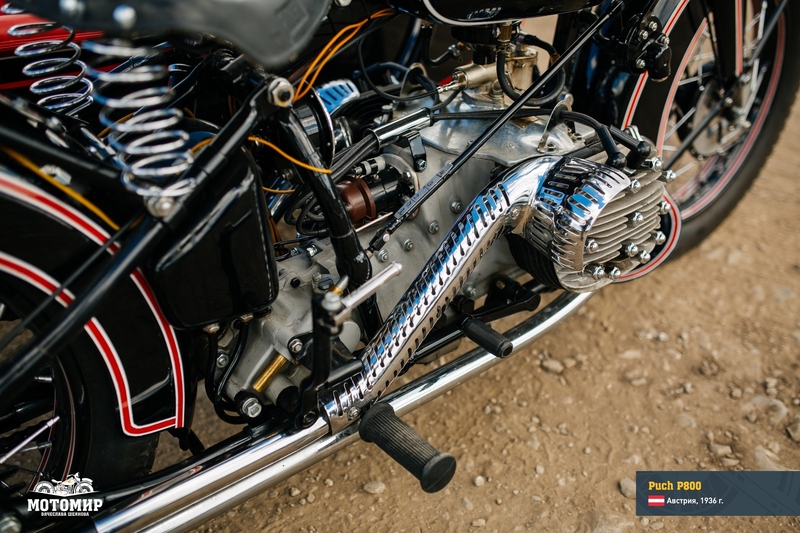 In the P800 an opposed L-head with battery-type sparking, with its four cylinders arranged under the angle of 170 degrees, resembling a practically flat V. Carburetor was located over the motor case in order to supply the mixture to both sides; the exhaust pipes emerged in front and at the back of the unit and merged on each side of the motorcycle in the exhaust silencer. 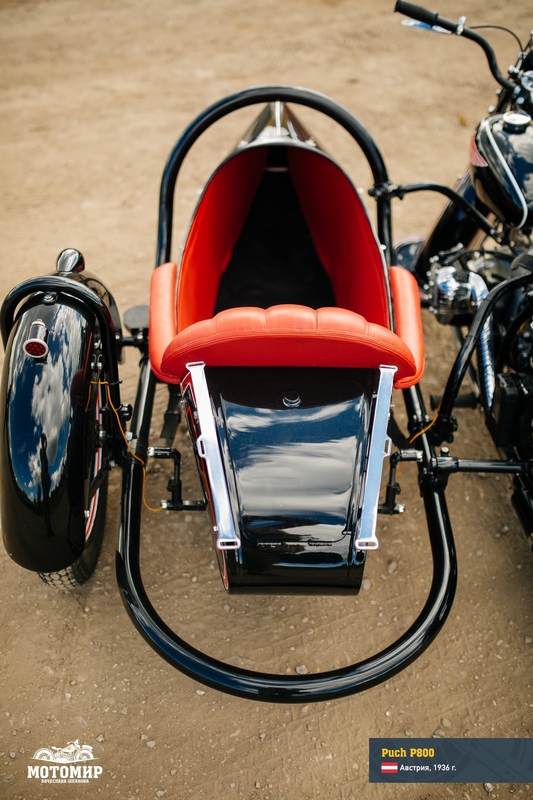 This engine used a dry-sump lubrication system, with the oil tank located under the seat. 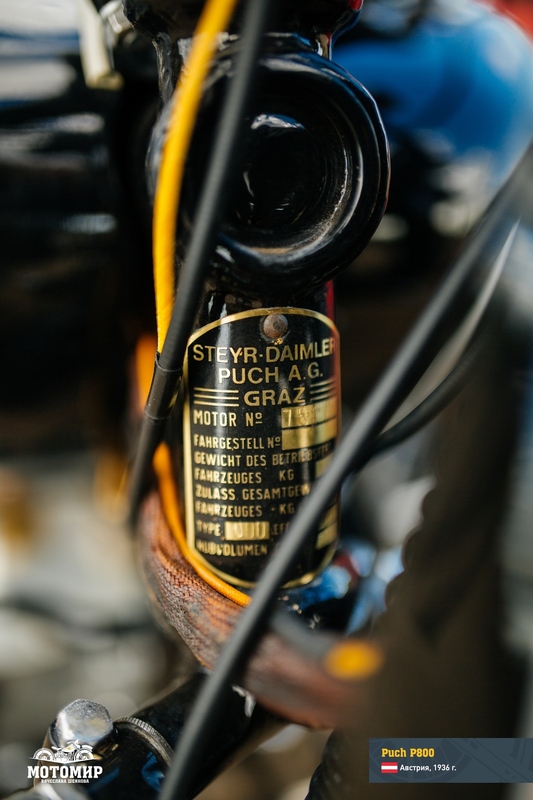 The generator was behind and to the left of the engine, driven by the crankshaft. 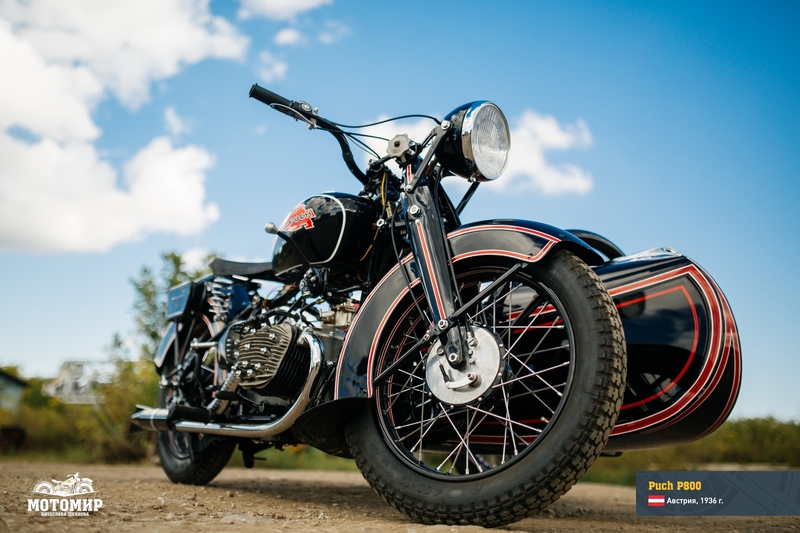 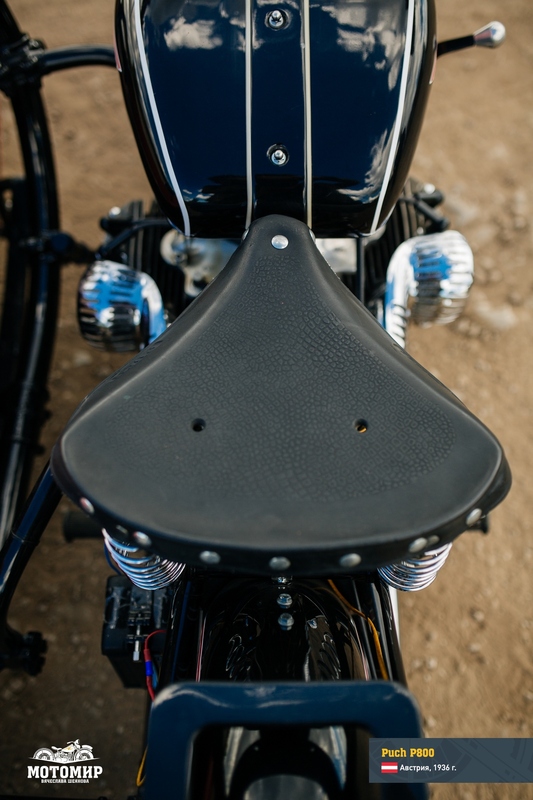 The transmission to the rear wheel was effected by way of a 4-speed manual gear-box using a chain drive on the left side of the motorcycle. 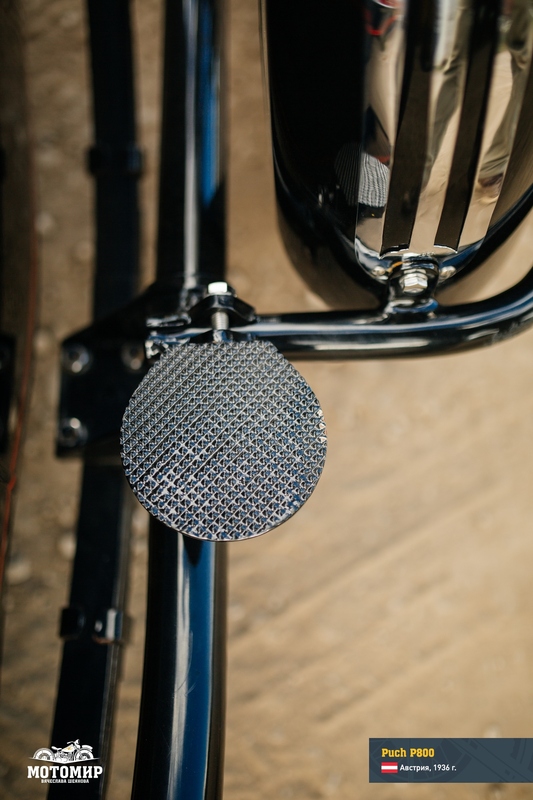 The clutch was located not between the engine and the transmission, but inside the rear-wheel center boss. 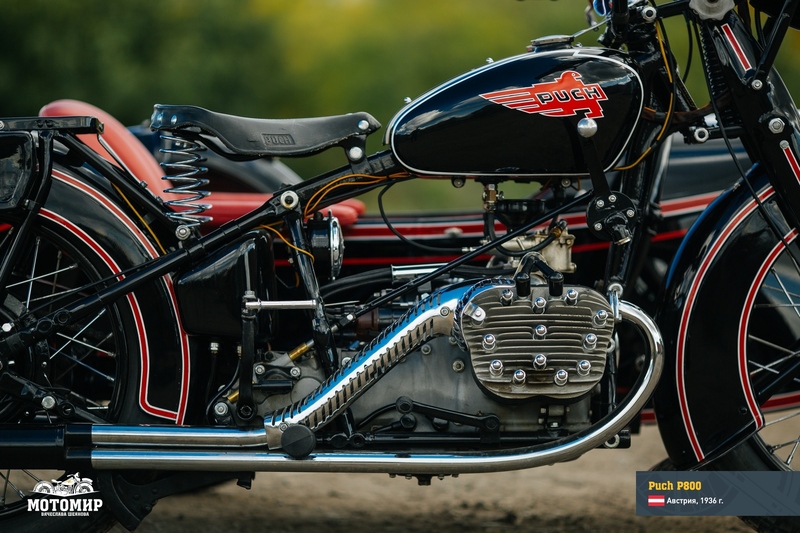 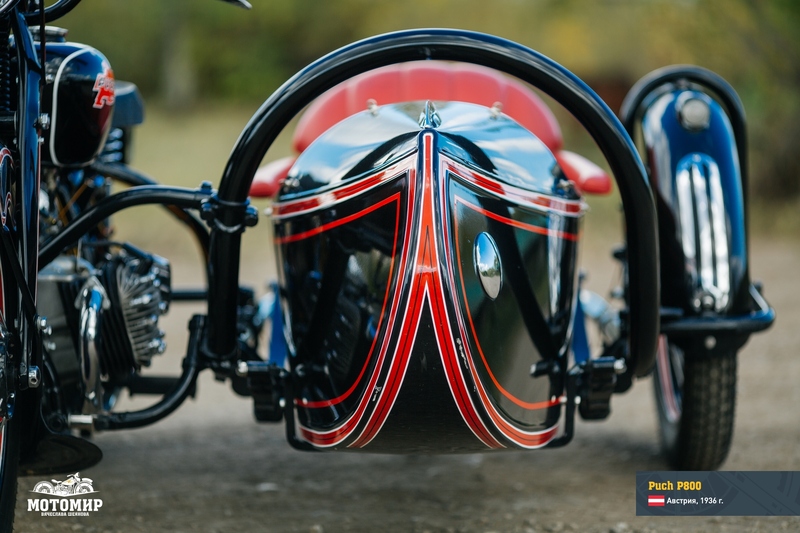 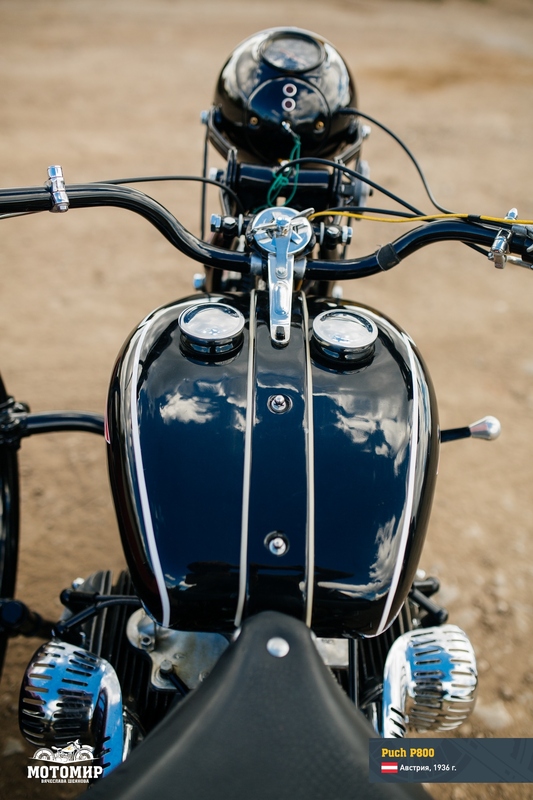 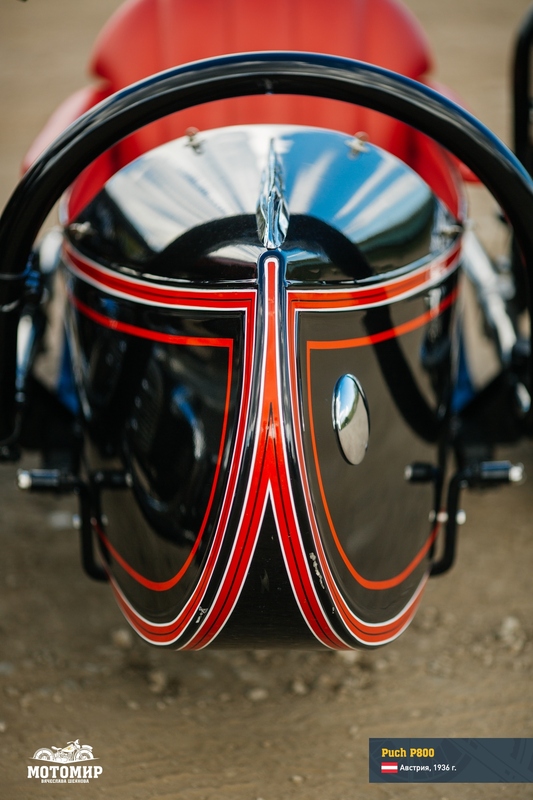 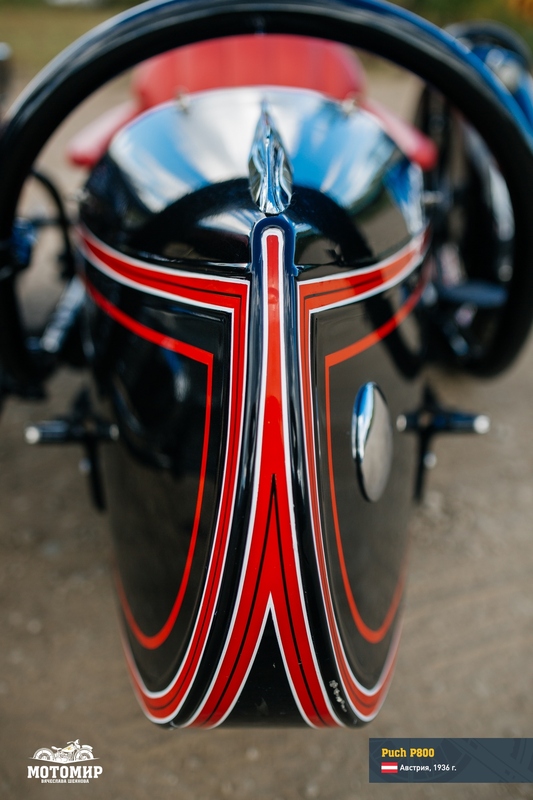 The engine was arranged compactly along the front to back axis of the motorcycle, sitting on a hybrid tubular-forged frame, which gave this motorcycle model an attractive and a practical look. 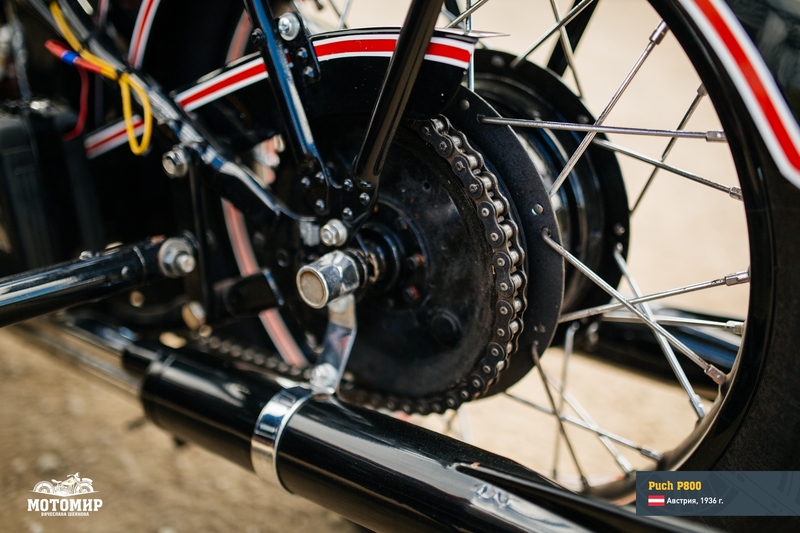 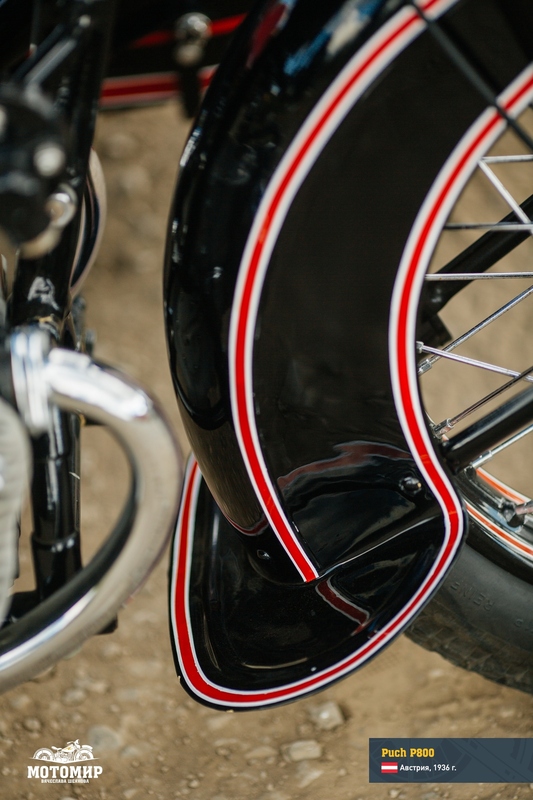 The front-axle fork was made of stamped steel plate and fixed on a parallelogram-type suspension using two cylindrical springs with frictional damper. 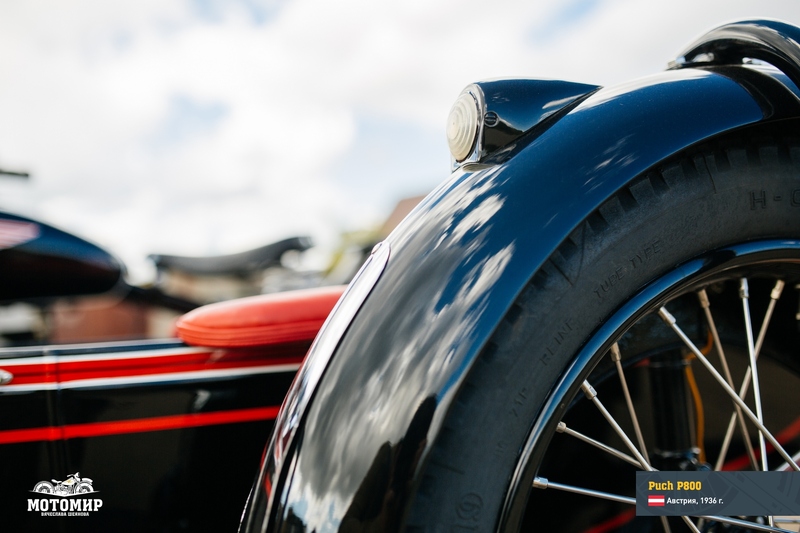 Rear-wheel suspension was unsprung. 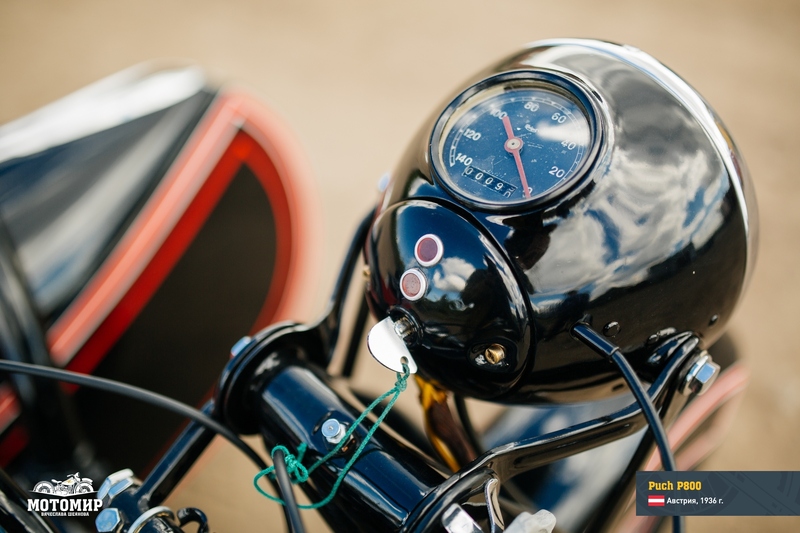 After Austria was annexed by the Nazis, the Puch company focused on the production of smaller motorcycles with two-stroke engines. 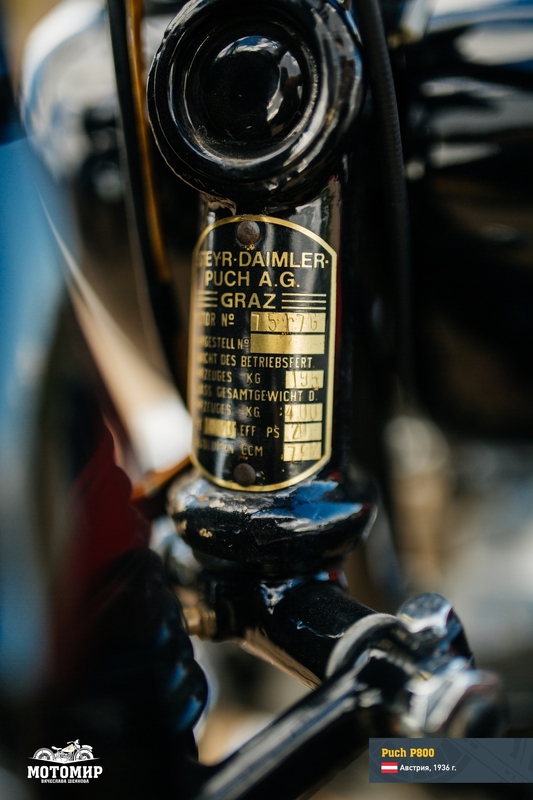 This was due to the fact that among the civil population there was not that much demand for the relatively expensive P800 under the conditions of the global financial crisis of the 1930s; also intense competition existed from such companies as Zündapp Werke, GmbH and Bayerische Motoren Werke, AG plus the German war machine placed new requests. 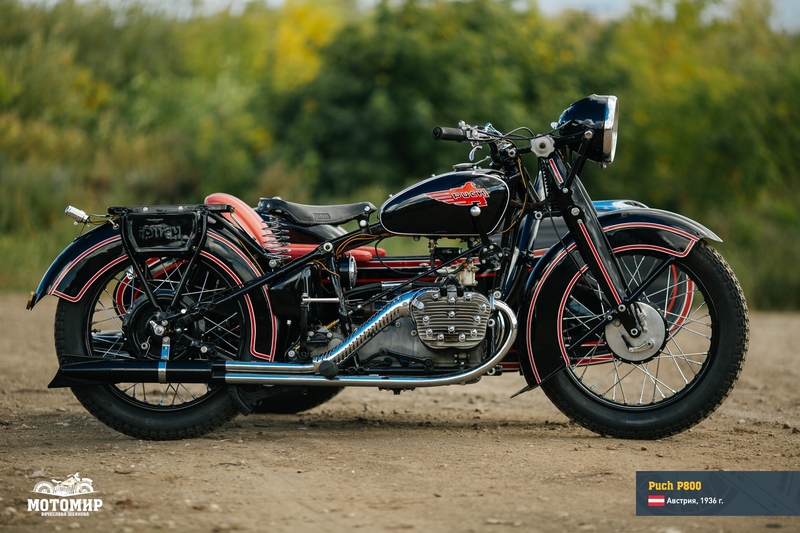 As a result, in 1938 the production of P800 was stopped, and only 550 machines were built by that time. 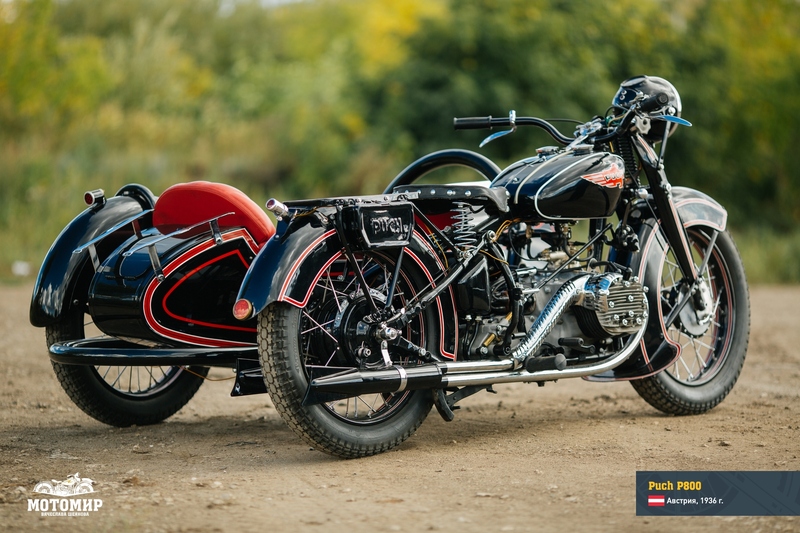 Most of these motorcycles were confiscated by German army and later destroyed during the battles of WWII. 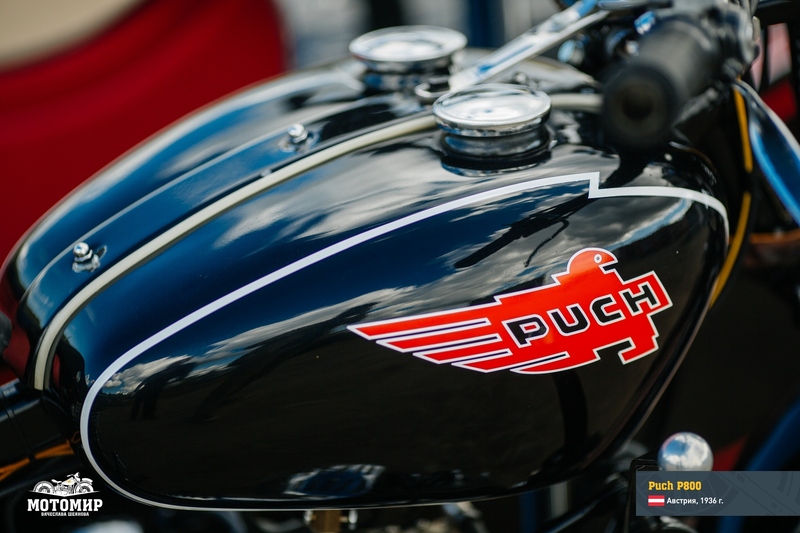 Today, there exist under 90 samples of this model all around the globe, and thus P800 is considered to be one of the rarest Puch Motorcycles.